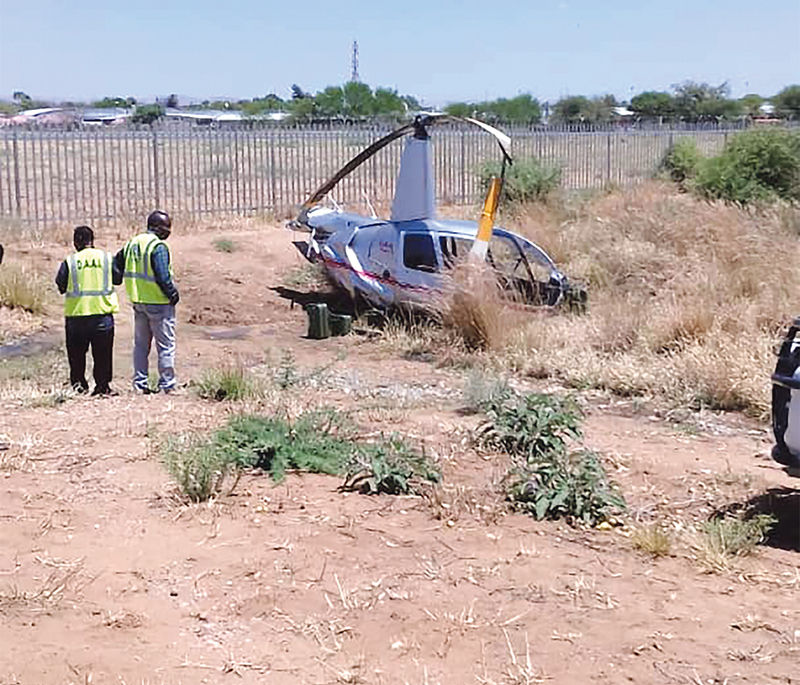 WIND shear forced the pilot and owner of a Robinson R44 helicopter to make an emergency landing in the bushes among the hangars near the busy Kupferberg Road on the northern end of the Eros Airport in Windhoek. 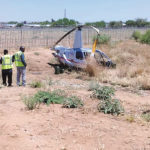 Theo Shilongo, Deputy Director involved with Accident Investigation at the Directorate of Civil Aviation, confirmed the incident and said both the pilot and his passenger walked away from the wreckage of the Robinson R44 helicopter unscathed. “At about 10:00 this morning the pilot, identified as H.B. Simon and a family member, Heinrich Arthur Simon, took off from special launch apron near the northern aircraft hangars. As they became airborne and while attempting to turn in a northerly direction, a strong gust of wind forced the aircraft to lose altitude quickly. The pilot was forced to make an emergency landing in the bushes and the impact with the ground caused serious damage to the helicopter,” he said. Dan Kamati, spokesperson of the Namibia Airports Company, also confirmed the incident and said the privately owned helicopter took off from the northern hangar area at Eros Airport. “It appeared that the helicopter did not gather sufficient power upon take-off and as result it landed in a river bed in the northern hangar area at Eros Airport. No injuries were reported and the Directorate of Aircraft Accident Investigation under the Ministry of Works and Transport is currently investigating the incident,” he said. A resident of Windhoek that lives near the airport reported on one of the many social media platforms used by neighborhood watch organisations that he was busy working in his driveway at home when he heard the engine of the helicopter make a strange noise and soon afterwards also heard the thud as the aircraft struck the ground. The person said he could see the wreckage from the double carriage-way between Academia and Pioniers Park and identified it as a Robinson helicopter.